It’s no secret that I was born in a foreign country. I am the son of Kurdish refugees from Turkey who came to live in Britain in the 1990s. In short, I am proud to be from a family of refugees – and proud to be British. I chose to make this country my home, London in particular, because I saw opportunities to live, work, study and start a family. I also found a home in the Labour Party. As I became drawn into politics, the party embraced me and that’s why I was so delighted to be picked as a parliamentary candidate in the Cities of London and Westminster last year. The question of how people talk about immigration is important to me because, whether we like it or not, it is an intensely political subject. And there is no greater evidence of that than the events that took place in Birmingham last week. The Tories’ pride in our nation is understandable – that national self-belief can be found in every party and in every town. But underneath their rhetoric is a distrust of immigration, whether from traditionalists such as William Hague to so-called ‘modernisers’ like David Cameron. My type of patriotism is very different. I love this country and my passion for it is based on its openness, tolerance and willingness to draw on the talents of all its residents, whether they were born in a castle, a council flat or – like me – in a different country. This is a special nation and a special people where, if you work hard, you can get on. It is not always easy, let’s admit it. There are still barriers based on gender, race and class – but it is a fantastic country, built on democracy, the rule of law and freedom of expression. Britain has a just reputation as a place of security and refuge. Groups ranging from the Huguenots escaping religious persecution in the 17th century to the Jewish and Irish refugees in the 19th century, and the Syrians and Somalis in the 21st century, have all found a warm welcome here. And each of these waves of immigration have brought a new spark of dynamism and innovation to the UK, whether in dedication to public service by driving our buses and Tube trains, or a lifetime of wisdom and care as NHS doctors and nurses, or that favourite tradition of running a small business. That’s before you get to the Windrush generation, who were treated appallingly by this government but have a special place in our hearts – especially here in south London, where so many of them found a home. Now our capital city has people whose families hail from the Indian sub-continent, Africa, Europe and the Middle East. They are all contributing to our society and culture and they have all added to the story of Britain. There is something else they have contributed to: the growth of our economy. A fact that once considered debatable is now proven beyond question. Researchers at University College London have shown that immigrants who arrived in Britain after the year 2000 made a net positive contribution to our economy, over the next ten years, of about £25bn. That’s whether they came from the EU or the rest of the world. Why? It’s because immigrants are self-selecting. I like to think we are entrepreneurial, ambitious and resourceful. We are more likely to start successful businesses, as I did in the restaurant trade, and today one in seven new start-ups in Britain is started by an immigrant. Now the task falls to our political leaders, as well as the media, to recognise the benefits of immigration. That means listening to people’s fears – and tackling them head on rather than pandering to them. Yes, we need rules that are fair, with borders that are secure. And it should go without saying that ministers must be tough on criminals, terrorists and people-traffickers, regardless of where they were born. To choke off immigration to meet arbitrary targets, however, or, worse, appease the worst instincts of racism and nationalism, is to commit an immense act of national self-harm. Tory hard Brexit, pandering to xenophobia, must not be allowed to damage our economy locally or nationally. In my borough, and across London, I see every day the part played by people from around the world, from the surgeons at St Thomas’s and the station staff at Waterloo to the person who serves your coffee or cooks your lunch in a local café. I believe immigration is good for Lambeth, good for London and good for Britain. Let’s make that case in a loud, proud and patriotic fashion. 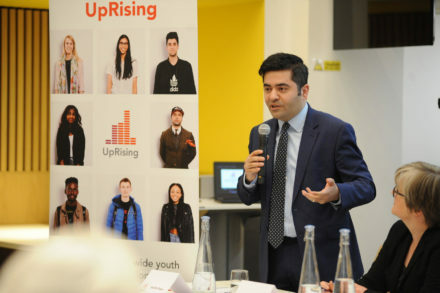 Ibrahim Dogus is a Lambeth councillor, an entrepreneur, chair of SME4Labour and was a PPC in 2017.